I guess I'm back! 2016 wasn't the best year for my family and I but there was a few highlights to stop it being so doom and gloom. I took most of the year out to breathe. No joke. I needed to breathe, up until the start of 2016 my days were always work, blog, plan, work, blog, plan. The times I was 'blogging' were really spent online shopping or singing my heart out listening to Youtube. I am the worlds best planner. From bullet lists, to do lists, organisers, diaries, schedules, weekly planners. I am honestly the best planner. The only problem I face is with all these amazing ideas and plans I write down to do or have, I never actually have the motivation to follow through. Since the summer I have had every month planned for both my blogs which I just couldn't get interested in writing. To take some pressure of myself I have decided to take away Voluptuous Chatterbox out of the equation and stick to A Bookish Redhead. A Bookish Redhead. I am Bookish and a Redhead but the name doesn't have to define that this blog is ALL about books. The majority - definitely. Although now I have a platform for lifestyle which I am going to start writing about. Book Blogging has changed dramatically since I started in 2011. Whether for the good or bad that opinion is entirely up to you. 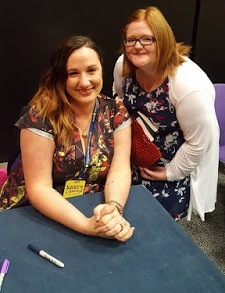 It's not about sharing the love of books, gushing in a review, getting major hyperventilating moments when your favourite authors agree to do a Q&A OR when you receive a book to review from a big publisher and it feels like you've made it in the world. As I will most likely carry on to go off topic (I have alot to say) I have got rid of most of my planners, organisers and kept two 2017 diaries. A mini one for personal use and a large one for blogging. It is not healthy for anyone to try and plan everything out right down to the smallest detail using coloured pens, highlighters and colour coordinate everything. My other half keeps telling me I need content, content, content. Not lists. He's been going on an awful lot so he better start reading A Bookish Redhead instead of dictating to me, the bossy so and so. This is my first honest, not planned or scheduled blog post waiting for the perfect date to post in a long time. This year I want to enjoy reading, i want to breathe in the words and absorb them (bookish peeps get me!) I want to smell old books (not weird! Many do it!) I also want to share the love of reading and books with others. There is so much help, love, life in books that anyone can enjoy reading. You just need to find that one book to kick of the book bug. I am one of 'those' Twilight girls. What book got you started into reading?